Whoever invented freezer paper needs a medal. And whoever discovered that freezer paper sticks to fabric when ironed and then peels off easily with no residue needs a REALLY BIG medal. 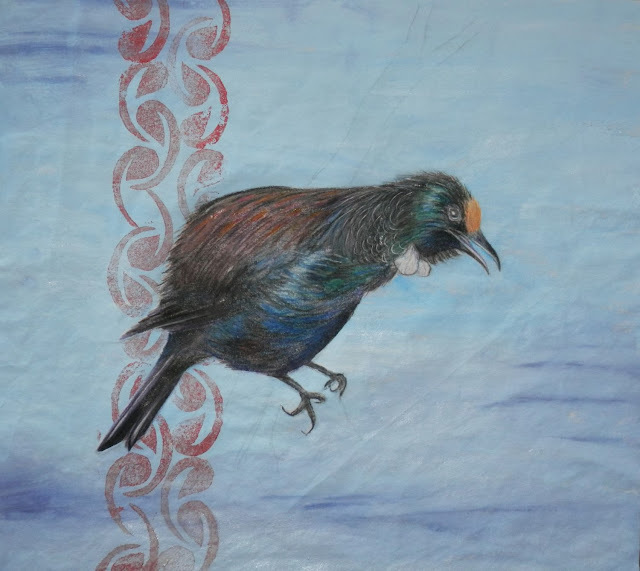 I wanted to carry on with my coloured pencil Tui experiment and had decided to paint the background. But how to get there? Well, here's an 'almost finished product' picture. 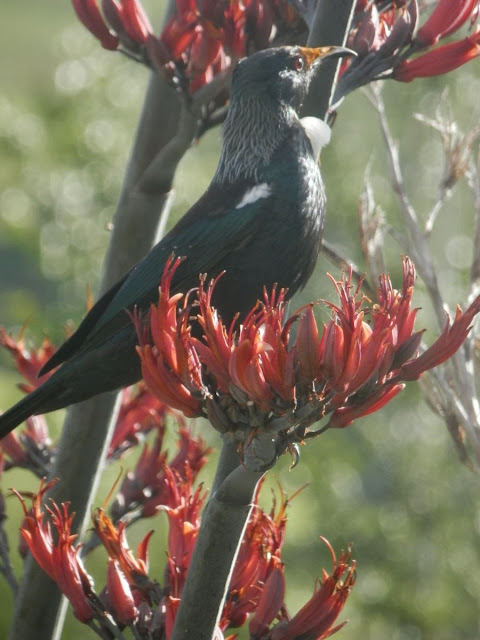 Next I need to work on the branch that the Tui is perching on. 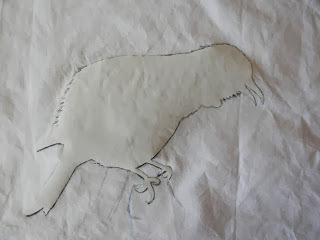 First off, I placed my freezer paper shiny side down over my Tui and carefully traced the outline. It's taped up on my window. I have got an insert for my SewEzi table to turn it into a light box but for a quick job it's just easier to use the window. Then I cut carefully around this outline. Use small, sharp, point-tipped scissors and take your time. 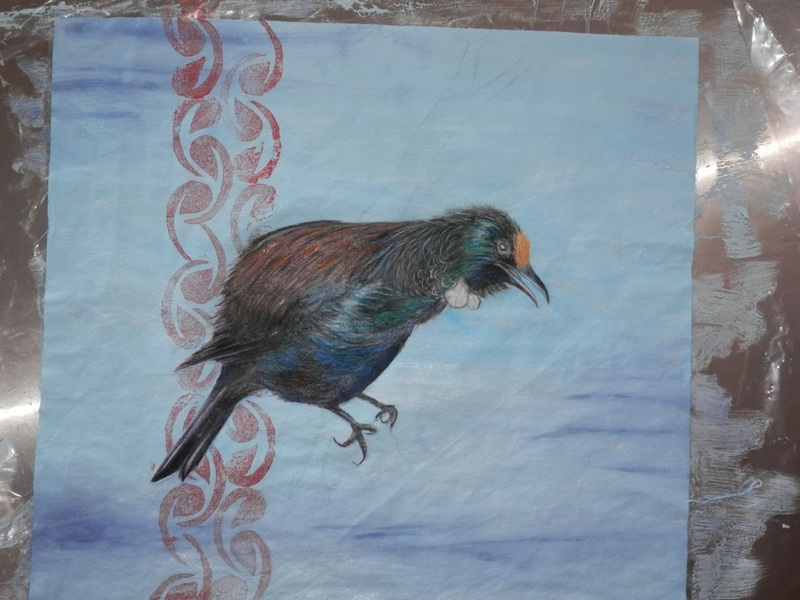 Once I was done cutting, I ironed it over my Tui until it was very firmly adhered. And then you can paint over the top. Easy! Just a couple of tips. Don't dilute your paint too much or it will run under the paper. Paint in strokes away from the freezer paper - if you paint towards it you risk lifting the edge. It's better to wait till the paint is dry before peeling the paper off, but if you are impatient you can, just be careful! And you can stamp, mono print, do whatever you like really. It's a post about a textile art exhibition that was held in Michele's town and it includes some beautiful feather quilts by quilt artist Julie Haddrick. 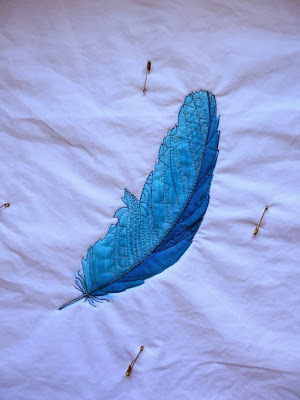 So then I went to the google machine and typed in 'feather quilt'. Look what I found! 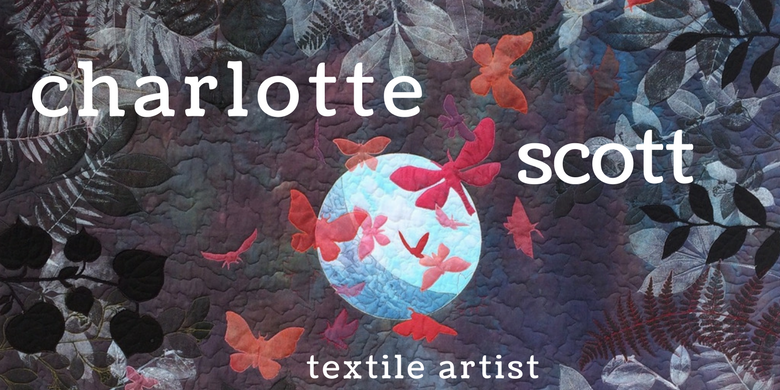 This is a quilt kit sold by Anna Marie Horner and you can buy it here. I obviously live with my head under a rock because there were HEAPS of these feather quilts floating round the interwebbies. Beautiful, and each version was a little different in it's own way. Of course I found lots of images of feather free motion quilting and feather duvets (mmm, snuggly), and some lovely bedding with peacock feathers all over it. There was this beautiful circa 1860 antique quilt for sale at an interesting site called 1stdibs. I got lost there for a while in the beautiful antique quilts...go look and wonder at the skills of our foremothers. I believe Amira made it for a mini quilt challenge. Isn't it a cutie? She has a nice blog, so hop on over and have a look. Then, oh my, I found The Magic Feather Project. Jude Hill started stitching feathers and many people sent there own little stitched feathers to her as a collective stitching project for creative sharing and giving. She intended to try and put them together for use as a charity project. There is a set of photographs of the feathers on Flikr. Click here to go and view them, please go, they are SO beautiful. They are mostly embroidered. I think I could actually contemplate embroidery if mine ended up looking like these. And for those who foundation piece (by the way I bow down to you in homage), there is this (scarily intimidating for me) feather block pattern. 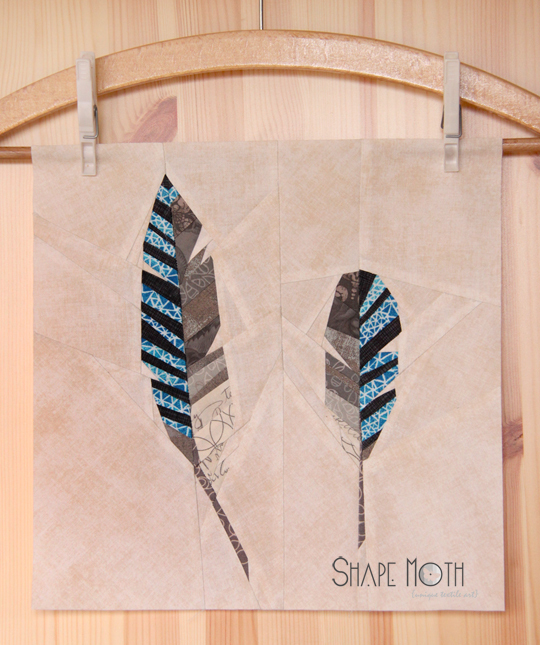 Designed by Shape Moth who has a list of jaw-dropping paper pieced patterns that if you are into them, you need to check them out. She also has tutorials and free patterns on her blog too. So it seems I'm not the only one who likes feathers...just thought you should know! I've put down the UFO's for a little while and I'm working on a few new projects. I've been mulling over thoughts for a while and then it's like they all collide and I'm away again, inspired and enthusiastic! 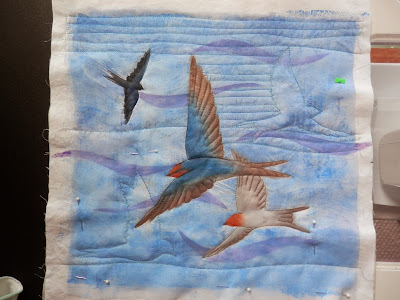 This swallow quilt is a what I'm working on today. 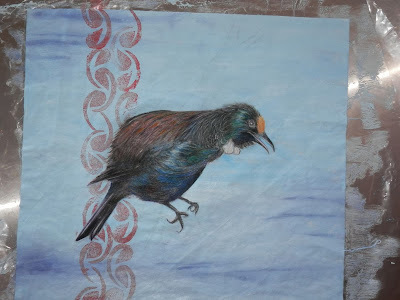 It's going to end up as 12" by 12" and will probably be an entry into the BLUE challenge that is being run by Aotearoa Quilters. You can read more about it here. It's open to non-members too, so go have a read. 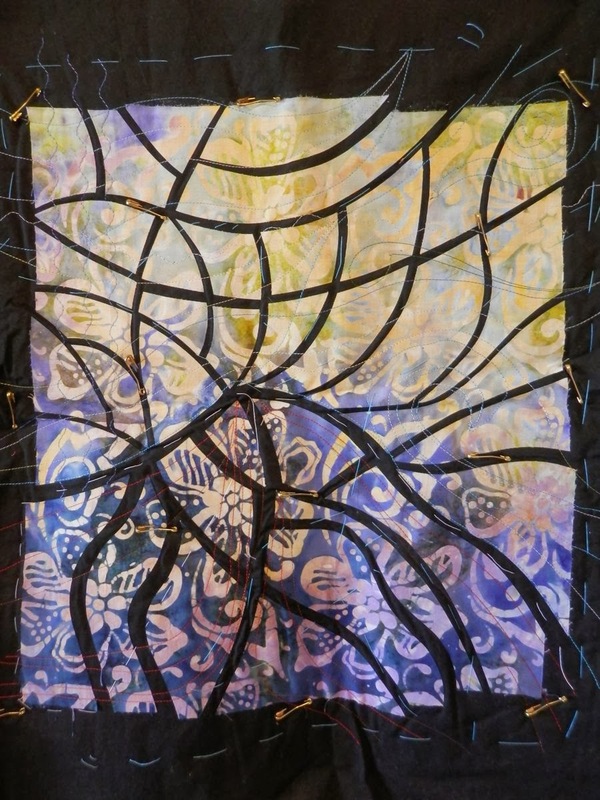 This is a two layered quilt, with a cotton broadcloth base and a silk organza overlay. I've mono-printed both layers, with a freezer paper mask in place over the swallows. I've then painted the swallow on the top layer and worked them in coloured pencil on the base layer. My coloured pencil work is a follow on from this experiment I did the other day. 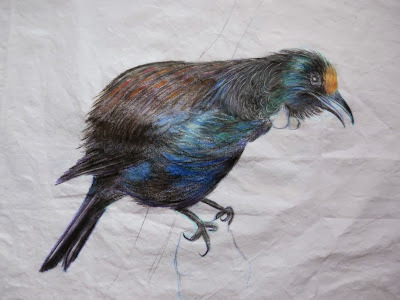 I worked the Tui (a native New Zealand bird, pictured here puffed up in full song) from a photograph taken by my talented cousin. You can see his work here on Flikr, he's dazzla65 - go check him out, he's amazing! 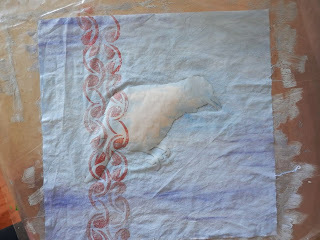 The top photo shows the 'before' version, before I painted over the coloured pencil with fabric medium. It worked so well that I can't wait to use the technique in more quilts. 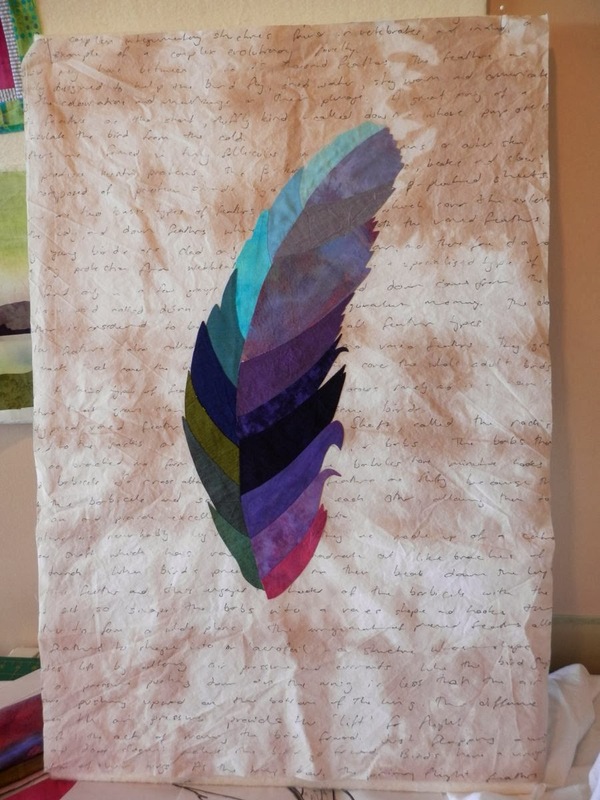 This feather piece measures about 20" by 30" and it's work towards a challenge run by the Auckland Quilt Club. It has a spine now, which makes it look better and now I'm debating on how to do the quilting. I tried out some quilting ideas on this little piece. 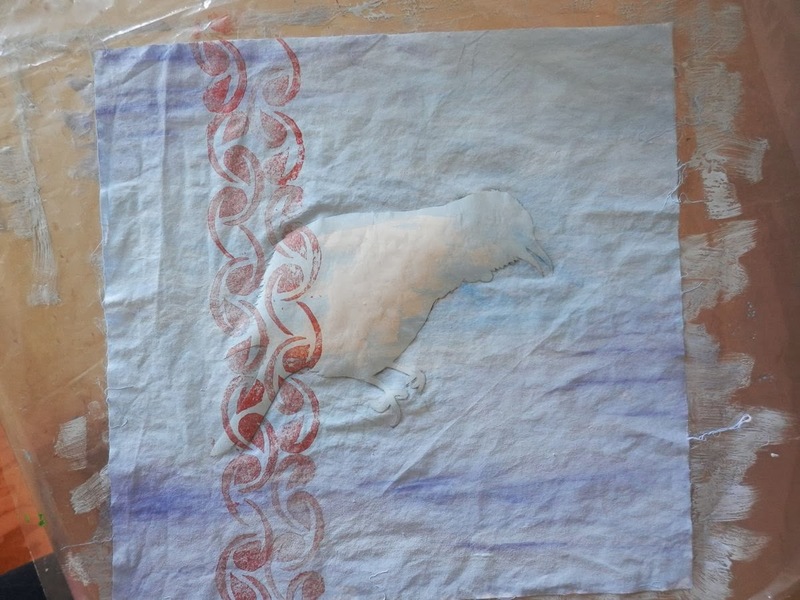 The feather was drawn using Neocolor water-soluble pastels then painted over with fabric medium. I've trimmed and bound it now and even added a label and hanging sleeve (I usually procrastinate over those tasks!) and it's another contender for entering into the 12 x 12 BLUE exhibition. Although I shouldn't really say a recipe, more of a food experiment. The kids asked if we could make cheese. Umm, No. Cheese making is not that simple. But I told them we could make a soft cheese. So we did. And then I wondered what to do with all that soft cheese. This is what I came up with and it is so good! Make a batch of creamy yoghurt in your yoghurt maker (or buy a litre - thick greek style is good). Line a sieve or strainer with cheese cloth (pour boiling water over it first) and place it over a bowl. Pour all your yoghurt (minus a few spoons the kids had for tasting purposes) into the sieve, place in fridge and let it drain overnight. Discard the liquid (or you could probably use it for baking bread or something) and place your yoghurt - now soft cheese - into a mixing bowl. Melt about (I wasn't measuring) 100 grams of chocolate in a bowl over a pot of simmering water. Beat this into the soft cheese quickly. Add 1/2 teaspoon of vanilla extract and a couple of spoons of sugar or honey to taste (I used milk chocolate so I didn't need much as it is already quite sweet. With dark chocolate, you may need more). 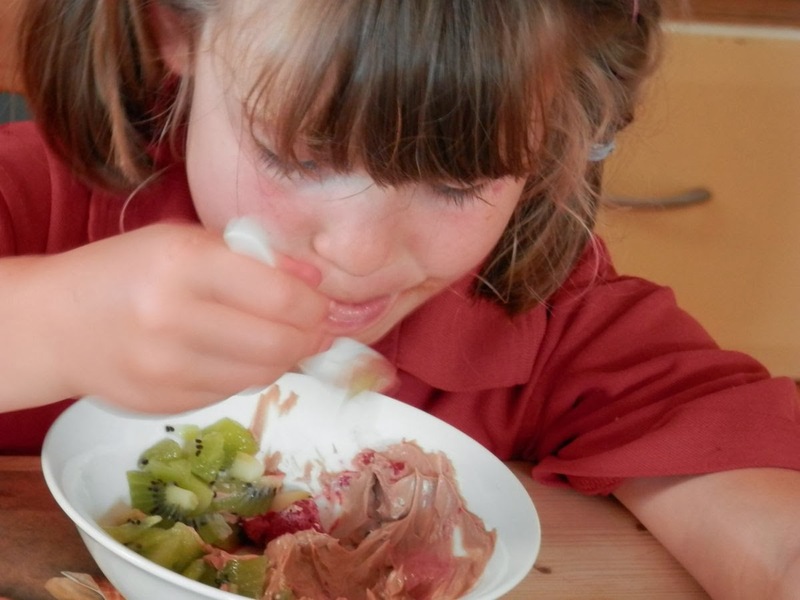 We had a big dollop with fresh fruit and it was delicious. I would also use it in place of a ganache or mousse or to add an extra 'wow' on top of a cheesecake or other dessert, like warm brownie. 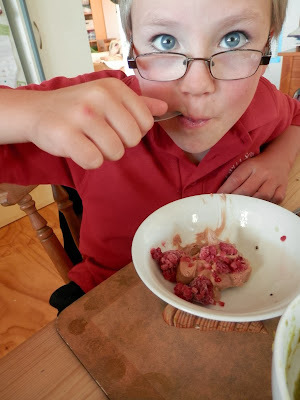 It was velvety and rich but not cloying and not too chocolatey either. Devine! 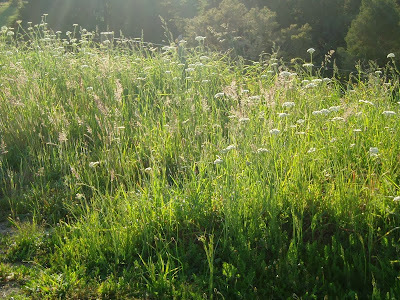 And just because it feels like Summer is truly here now, I'm leaving you with my favourite summer evening photo. Enjoy! Last weekend was the Bay of Islands P and I Show. Show days can be a big thing in rural areas. Agricultural and pastoral shows or pastoral and industrial shows, whatever you want to call them, they are a chance for everyone to get together and socialise and show off their talents, whether that be cake making or calf rearing. Now that I have kids at school, I have two show days to prepare for. The kid's school show day comes first, so nothing got entered into the town show this year. 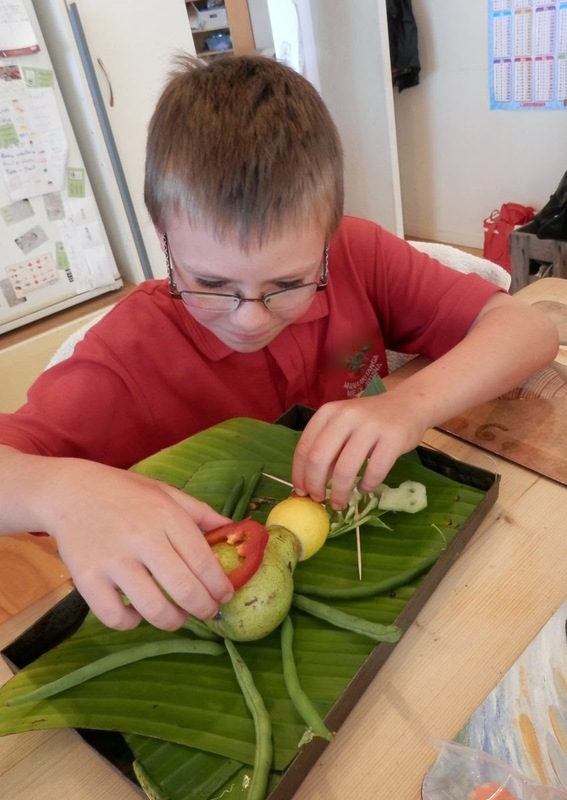 But the kids are keen to enter some categories, so next year's town show week is shaping up to be a busy one. Instead, we concentrated on the school show day. 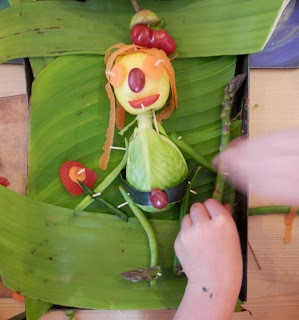 I admit I had fun helping them with their vegetable models for the classroom display! They also made pikelets, lego models, aqua jars and dressed up. The town show (Bay of Islands P and I Show) was great fun too. 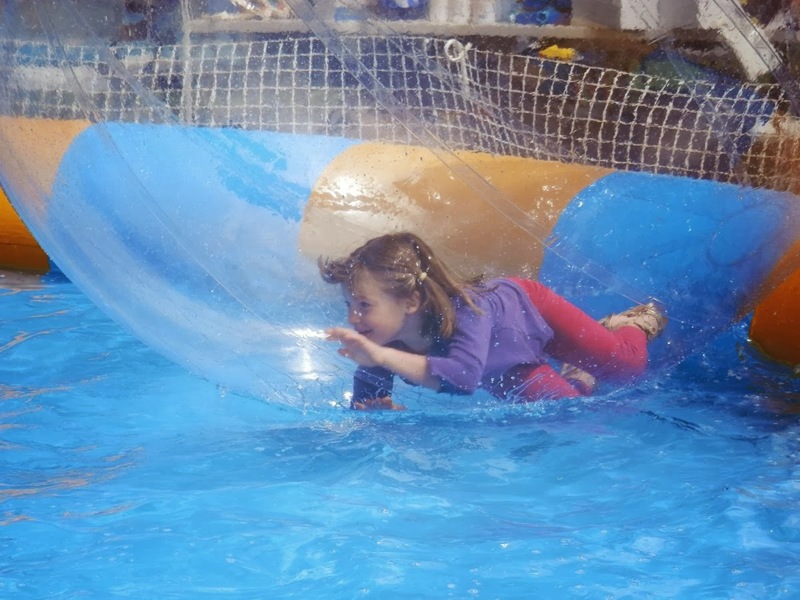 The kids wanted to ride everything, but we managed to narrow it down to the bouncy castles and then a mechanical bull ride for my son and a blow up floaty ball thingy for my daughter. 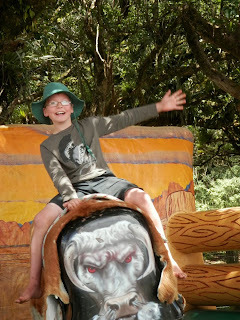 We sat and listed to local music, ate candy floss and admired the animals and crafts. Then we came across the local creative fibre stall. My kids were fascinated by the spinning wheel and wanted to learn how to do it. Who knew?! 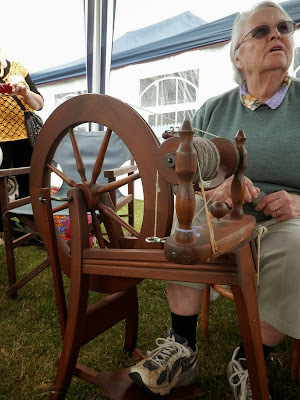 The woman who was spinning generously gave us some carded wool to take home and now the kids are pestering their Grandma (who happens to have a spinning wheel tucked away) to teach them how. I also said I'd youtube how to make a drop spindle and we'd learn that too. Me and my big mouth! I'll let you know how it goes. Sorry for the radio silence lately - my internet has been down - peaceful at first and then frustrating! I've been thinking about my pile of UFO's or WIP's - yeah, I know, nothing new about that! But I do want to whittle them down. I was taking stock today and I saw this piece in the stack. It's been taking up valuable real estate in my cupboard for several years. I don't even know what it was intended to be. 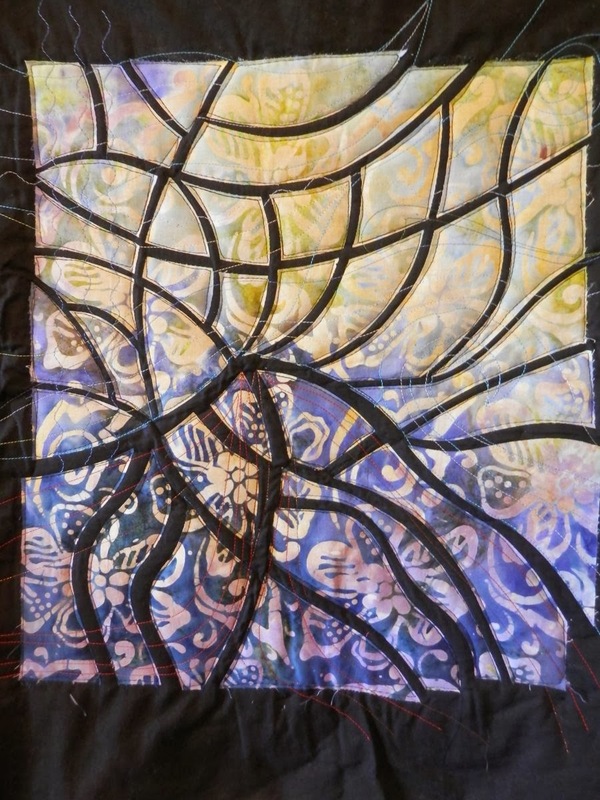 Some sort of fractured/stained glass thingy that I had fused and then appliquéd random patterns, not even around each edge so not very stable! 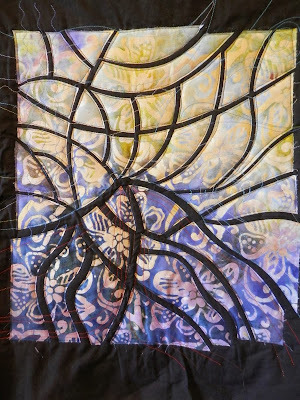 So I shoved it under my needle and quilted it in black thread around each piece of coloured fabric. It gave it a sketchy look I liked and would help hold the fused bits of fabric down. 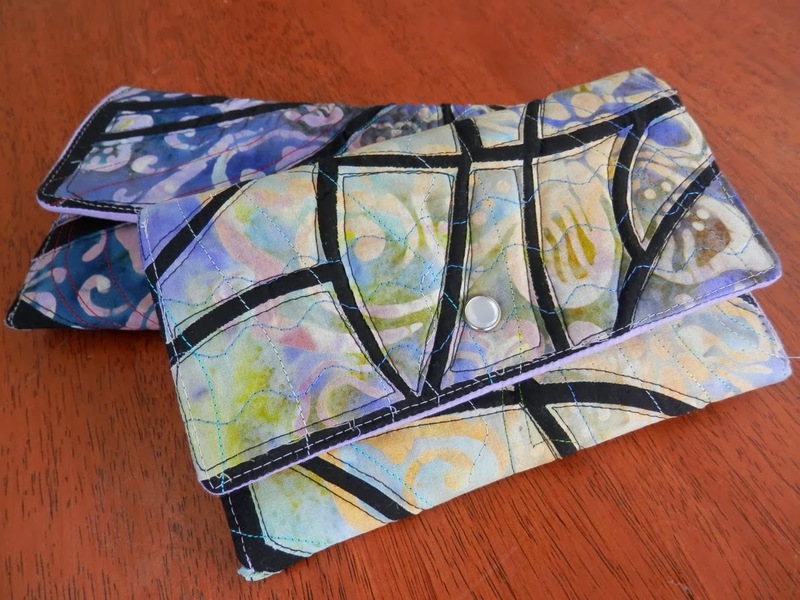 Then I found Catherine Parkinson's tutorial on making little pouches/purses out of practice quilts and followed the instructions. 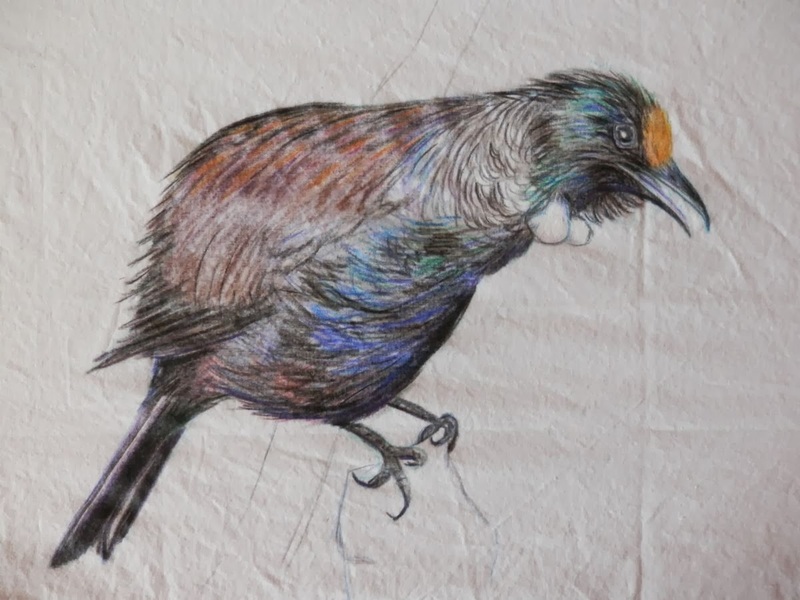 Catherine is a New Zealand blogger who quilts and photographs and sketches and is well worth checking out. There were a couple of things I did differently. In step 8, you need to put your pieces right sides together - but you'd have figured the out anyway. When you are stitching two layers together around the edges to then turn right sides out and you have to leave a gap to turn them through, I always mark when I have to stop stitching with a double pin. It must be the way my brain works, but too many times I've kept on going right the way round the whole edge - doh! 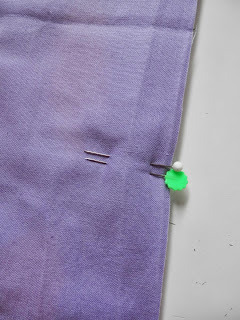 I used a popper, or dome fastener instead of stitching on velcro - but that's personal choice. They are easy to put in, you just need a cheap tool that you buy at the same time as the domes, a hammer, some brute force and a little bit of patience to line them up. I ended up with two cute little purses. The back one has been claimed for my rotary cutter and the front one will go in the 'to be gifts one day' stash. I'll leave you with an image of what's happening outside my back door. Tui feeding on flax flowers - so lovely to watch. 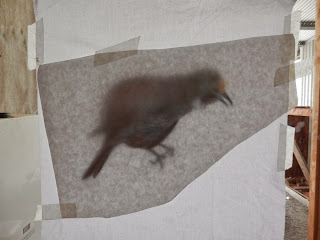 I gleefully spent Saturday just been at the Auckland Festival of Quilts. A carful of us left early early and travelled down for a bit of eye candy and (for the unrestrained of us) some shopping! Quilting Focus is a new international directory of everything to do with Patchwork and Quilting. At present the Directory is open only to New Zealand and Australian listings, other countries will be added later. I thought I'd check it out and it looks like a handy site to bookmark. And I couldn't resist sending off my blog address to them to add to their listings....and I'm their first blog!! So get adding people! Click here for their site. Or type www.quiltingfocus.com into your browser. I'm going to add a permanent link on my sidebar so you can all find it again later if you need too.